Kerry Hammond recently met author Bailey Cates at a fun tea salon event. She's here today to tell us about all about it, and hang on until the end because were giving away one of Bailey's books. I recently discovered a new book club, held at the Denver Tea Room & Coffee Salon. Once a month the Tea Room hosts a Women’s Book Lovers Tea Salon. We spend a few hours on a Sunday having afternoon tea with the ladies (complete with cucumber sandwiches and scones) and talking about books. Each month we read a book written by a woman, and whenever possible we try to choose a local author. When reading a local author, we are sometimes fortunate enough to score a guest appearance by that author. August was one of those fortunate months. We read Some Enchanted Éclair, and had tea with the author, Bailey Cates. 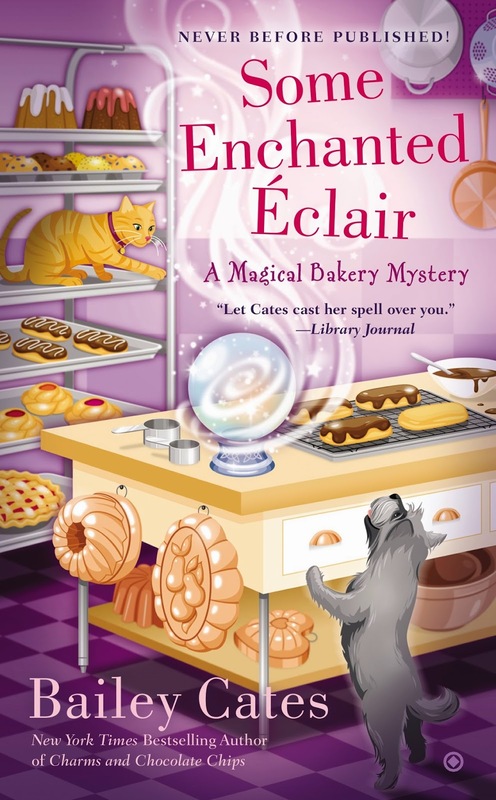 Some Enchanted Éclair is book #4 in the Magical Bakery Mystery series, also known as the Lightfoot Chronicles, as it features Katie Lightfoot, a witch and professional baker. Bailey Cates also writes as Cricket McRae and K.C. McRae, but will answer to any and all of her chosen nom de plumes—even if none of them are her real name. 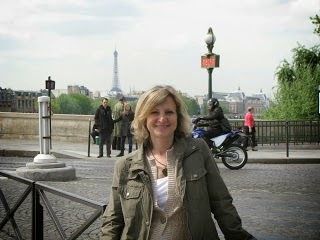 She has several books in addition to the Magical Bakery Mystery series. There are currently 6 books in her Home Crafting Mystery Series (written as Cricket McRae) and she is just about to release Shotgun Moon, a darker story that diverts from her more lighthearted books. Shotgun Moon is written under the name K.C. McRae and is due out this month. Check it out, it looks really good. The books in the Magical Bakery Mystery series take place in Savannah, Georgia and center around Katie’s newly discovered skills in witchcraft, and her ability to solve crimes. In this installment, a movie company is in town to film a Revolutionary War movie. The town is all abuzz and some of Katie’s fellow witches even take part and appear in the film as extras. One of the member of the film crew, a man known as “the fixer” fires the film’s caterer and the Honeybee Bakery is hired to take over. The Honeybee is the shop where Katie works, is owned by her aunt, and is the location of her coven’s spellbook club meetings. When the aforementioned “fixer” is found dead, Katie gets more involved than she’d planned, and is even more drawn in when a psychic who works for the lead actress predicts that Katie will be the one to solve the crime. Some Enchanted Éclair was a great read and we had a lively book club discussion. Everyone loved the book and many of the members in attendance had read others in the series. The characters are well written and very colorful (I did mention many of them are witches, right?). The mystery really drew me in and I enjoyed the twists and turns it took to get to the truth behind the murder. To prep myself for the characters, I read book #1 prior to reading #4. I found that although I normally prefer to read the books in order, I did not have a problem jumping ahead. The books stood alone as separate mysteries, while giving enough backstory to allow me to follow the changes in the characters’ lives. Don’t get me wrong, I plan to go back to book 2 and book 3 before there is a 5. Bailey Cates was gracious enough to answer all of our questions about her books, her writing, and her life in general. She even gave us a few hints as to what we can look forward to in future Magical Mystery books, without giving away any spoilers. She told us about her writing career, how she ended up as a full-time mystery writer, and her past life as a soap maker. You can read about her on her website here. Bailey was also generous enough to donate a signed copy of Some Enchanted Éclair for readers of the Mystery Playground blog. Simply comment on this post to be entered to win (US residents only). I hope you love the book as much as I did, and seek out the other titles in the series. Love this and the book sounds great. Thanks to both Kerry and Bailey. Sounds like a great read! How exciting. A unique and delightful book which sounds entertaining and captivating. Thanks. I love Bailey Cates books and the touch of witchery combined with life in the South makes it only better. Can't wait to read. This sounds right up my alley. Love this series and looking forward to reading this one. You had me at eclair! Looks like a fun read! Had such a good time with the ladies of the Denver Tea Room Book Club! Thanks for the shout out, Kerry, and best of luck to everyone in the drawing! Our winner is Dotty Kelley! Congratulations. Look for an email soon.